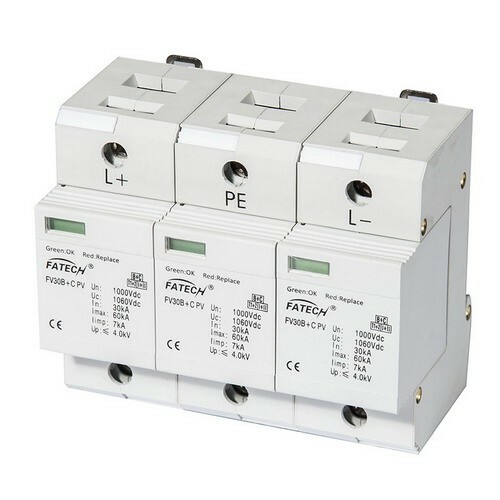 ﻿ On-grid surge protection - Fatech Electronic CO., LTD.
Fatech Electronic (CHINA) LTD 's DC surge arresters are used for protection of photovoltaic on grid systems, Uc pv up to 1200Vdc, Class I, Class I+II, Class II are available. These Pluggable DC surge arresters are with remote control contacts and inspection window for your option. It is recommend to choose them with remote control contacts, and 3 poles (Y type). Type 1, MOV based. 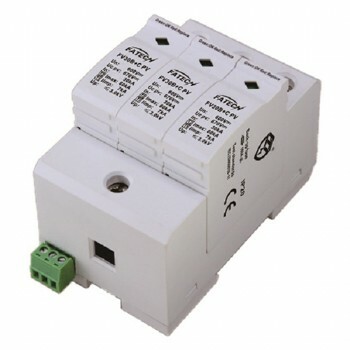 DC surge arrester for protection of photovoltaic system. PV system 600Vdc. Iimp=25kA(10/350us),Imax=100kA(8/20us). With inspection window, with remote control contacts for your option. Type 1, MOV based. 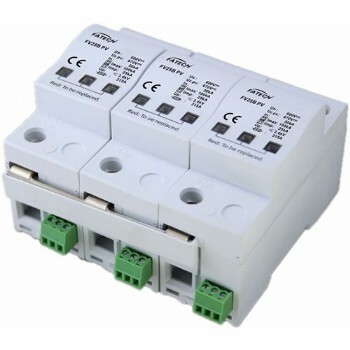 DC surge arrester for protection of photovoltaic system. PV system 500Vdc. Iimp=25kA(10/350us),Imax=100kA(8/20us). With inspection window, with remote control contacts for your option. Type 1+2, MOV based. DC surge protector for protection of photovoltaic system. PV system 1000Vdc. Iimp=7kA(10/350us),Imax=60kA(8/20us),In 30kA(8/20us). With inspection window, with remote control contacts. Type 1+2, MOV based. PV surge protector for protection of solar system 1000Vdc. Iimp=7kA(10/350us),Imax=60kA(8/20us),In 30kA(8/20us). With inspection window, without remote control contacts. Type 1+2, MOV based. DC surge protector for protection of photovoltaic system. PV system 600Vdc, 3 poles. Iimp=7kA(10/350us),Imax=60kA(8/20us),In 30kA(8/20us). With inspection window, with remote control contacts. Type 1+2, MOV based. 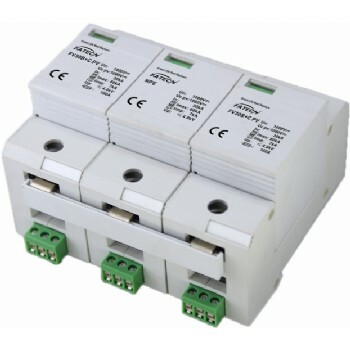 DC surge protector for protection of photovoltaic system. PV system 500Vdc, 3 poles. Iimp=7kA(10/350us),Imax=60kA(8/20us),In 30kA(8/20us). With inspection window, with remote control contacts. Type 1+2, MOV based. DC surge protector for protection of photovoltaic system. 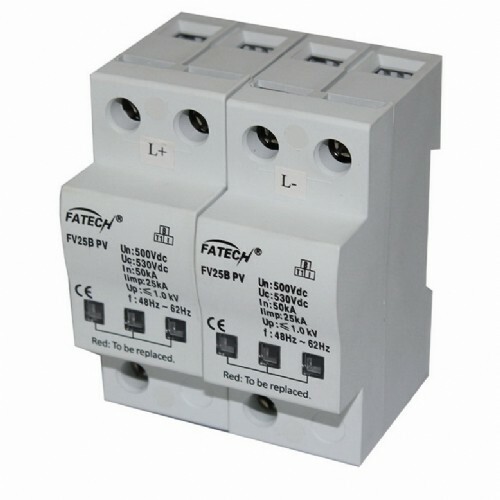 PV system 500Vdc. Iimp=7kA(10/350us),Imax=60kA(8/20us),In 30kA(8/20us). With inspection window, with remote control contacts. MOV+GDT based. 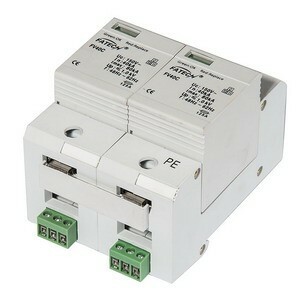 DC surge arrester for protection of photovoltaic system, PV system 1000Vdc, common & differental mode. Imax=40kA(8/20us), In 20kA(8/20us), Up ≤3.6 kV. With remote control contacts & inspection window.